The Grand Rapids Griffins just finished playing through one of the busiest weeks of their season so far. 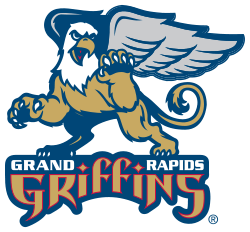 The Griffins won three of the four games this week, capped off by an overtime victory Saturday night against division rival Chicago Wolves. The Griffins started the week off on last Sunday afternoon with its second loss and second shutout in as many games. The Toronto Marlies dominated the Griffins winning by a score of 5-0. The Marlies were led by a shutout performance by goaltender Jussi Rynnas, who stopped all thirty-one shots he faced. Marlies center Keith Aucoin shined on offense scoring two goals including the game winner. Grand Rapids bounced back three days later at home defeating the Rochester Americans 4-2. Rookie Luke Glendening had a huge first game of his Griffins’ career. He scored his first goal on his first shot of his first shift in his first game. He also took home the First Star honor for the game. Friday night was a matchup of division leaders Abbotsford Heat and the Griffins. Despite being outshot by the Heat, the Griffins managed to take advantage of their chances scoring five goals to just one from the Heat. Griffins goaltender Petr Mrazek kept the Heat cooled off, stopping all but one of the thirty shots he faced. Mrazek came within four minutes of his first career shutout before giving up two late. Saturday night brought the Chicago Wolves into Van Andel Arena for a matchup of division rivals. Sixty minutes wasn’t enough to decide this game as the two teams skated to a 1-1 tie after the third period. The Griffins earned the extra point for an overtime victory when Brian Lashoff scored the game winner at the 2:49 mark of overtime. The win gives the Griffins some breathing room atop of the Midwest Division. Grand Rapids now sits alone, atop first place with thirty-four points, four points ahead of Chicago, Rockford, and Peoria who all are tied at thirty points each. The first place Griffins are now off until Friday when they finish up the calendar year with three big home games. Friday and Saturday Grand Rapids will face off against the Marlies to try and avenge the 5-0 loss suffered this past week. Then a New Years Eve matchup against division foe, the Rockford IceHogs, will complete the 2012 schedule.